The last couple of weeks have been very busy, preparing for the Stoneleigh show and the follow up afterwards. My apologies to anyone who has not had a response as quickly as you might have liked. No sooner is the show over and we are now preparing for the Open Day on the 31st March. Don't forget to spread the word around your group and tell you friends. We look forward to meeting you at our Open Day and hope you will find it warmer than last weekend at Stoneleigh. Light refreshments will be available. 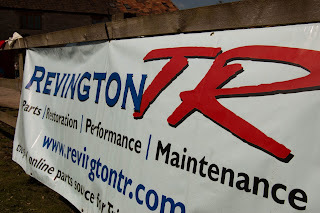 All of us at RevingtonTR look forward to having a great day and we hope you do too..